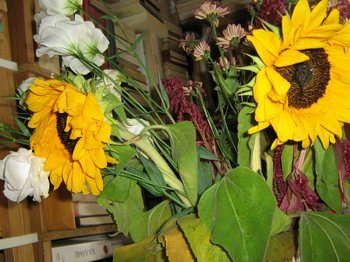 Flowers from the Coptic florist by the Monoprix on rue Linois. 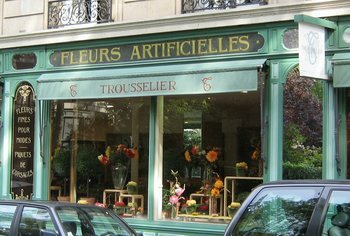 Artificial flower store facing the Square Louis XVI near the boulevard Haussmann in the 8th arrondissement. Looks like it has been there for a long time. 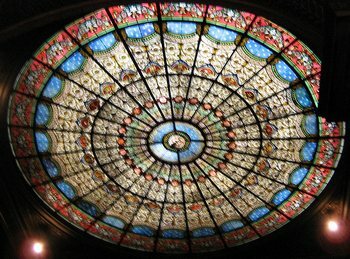 This rose window is in the ceiling, not the transcept wall, in the Saint Philippe de Roule church, located on the rue Faubourg St. Honoré in the 8th arrondissement. 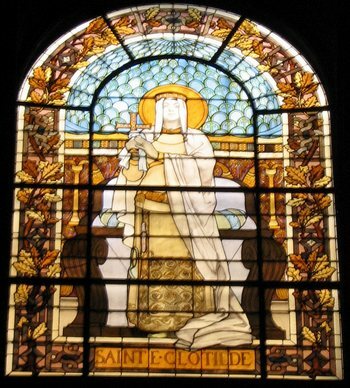 A window featuring Sainte Clotilde in the Saint Philippe de Roule church. We met three Delta 777 pilots (each had some Ohio connection) last night in the neighborhood brasserie, and I gave them some restaurant recommendations in the neighborhood. (They’re staying in the Novotel.) I forgot to include Le Bayadère on rue du Théatre! That restaurant is so good and such a good value, and it is near their hotel! How could I forget it! I hope the pilots check my web site today and see this addition. During much of this past week, it has been rainy. Just like the day that we happened to stop for a drink on a boat on the Seine, just before a downpour started, we had another day of impeccable timing when we went for a long walk on Thursday. We walked all the way from our apartment in the 15th to the Saint-Germain-des-Prés area, stopping first to gauge the length of the line at the Musée du Quai Branly (still about an hour’s wait). 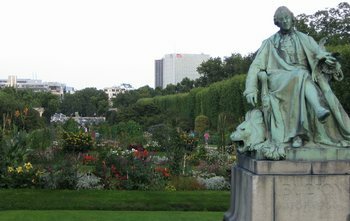 By the time we were in the 6th arrondissement, we were footsore, thirsty, and a bit hungry. It was only just barely happy hour time, not dinner time. We had not eaten lunch. I remembered that Ron B. told us about a Belgian seafood brasserie right there on the boulevard Saint Germain. Reasoning that most brasseries have continuous service throughout the day, I decided that we should find it and give it a try. It is right there, big as life, in front of the Mabillon métro stop on the boulevard Saint Germain. As I was standing in front of it, examining the menu, a few raindrops started to fall. I went in, and Tom followed. There was no server in sight. The place was quite large, but I think only a couple tables were occupied. We stood for a while, waiting to be recognized and seated. When nothing happened, we seated ourselves in the sizeable no-smoking section. Outside, the downpour started. The servers had not extended the awnings, so all the outside tables were wet. We were so happy to be inside, it didn’t matter that time went by and still no server had appeared. On a flat-screened TV, a silent but modern video was showing how the mussels served in this Belgian brasserie, called Léon, were caught, washed in sea water, packed into burlap bags which are sewn shut by hand, shipped in big, sleek semi-trucks into Paris each night, and prepared to order, as fresh as can be, right downstairs in Léon. Although quite self-promotional, the brasserie’s video was interesting and captivating. It poured and poured rain outside. We were smugly sitting, warm and dry, in this bright, sparkling clean, big brasserie. Finally, a couple servers appeared. They had been treating themselves to a break. The mussels were soft, fresh, and perfectly fried – not greasy at all. This preparation was called “la petite friture de moules.” It came with a sort-of tartar sauce made with wonderful crème fraiche (like sour cream, but much better). We’ll go back for a main meal sometime soon. The main-course mussels are made many different ways (not fried! ), and you can order them to be made with exactly the ingredients you want. They are served in the “cocotte” (a heavy, brightly colored, enameled, covered saucepot) in which they are cooked. We ordered in French, of course, and were perfectly understood. But I saw a family of three, a rather prosperous looking trio, come in and after saying “bonjour” very nicely, they spoke to the server in precise, but accented, English after that. They were almost perfectly understood. I think they were from Russia or eastern Europe. So please don’t let fear of speaking French keep you away from this city with its many delights and wonders. The rain stopped, we paid up, said our thank you’s and goodbye’s, and all we had to do was slip out the front door and down into the station at Mabillon where the métro zipped us home in no time. This morning Tom and I had a nice, long walk during which we bought three French newspapers, tomatoes, and wine. I learned that the young man who is helping to tend the wine shop during the vacation month of August speaks beautiful English, practically with a British accent. And here I’ve been speaking my wounded French to him all these weeks!